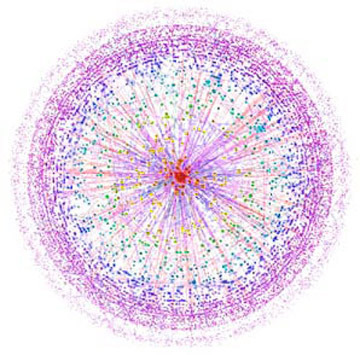 The above picture may look like an exploding galaxy or a human cell magnified many thousands of times but it is actually a map of the internet. The internet (short for interconnected network) can be thought of as an arrangement of electronic pathways (copper wires/fibre-optic cables, etc.) connecting nodes (special computers known as servers) to create a vast communications and data-storage medium. Strictly speaking the internet is just the name for the network of paths and nodes, and it does not include items like the home computers that link to it, or the software programs that run on it (such as the World Wide Web or email). However, from a Media Studies standpoint, the way people experience the internet becomes an important factor to consider when trying to define it. In this sense, talking about the internet as just a network of paths and nodes, is like talking about television as just a network of transmitters and aerials: statements which are factually true but do not convey anything meaningful about the way these two media are used. So the definition used here will follow the common ‘misunderstanding’ of the internet as a combination of networks, computers and software. The internet is a truly multi-media experience: all forms of information are found there including: text documents, photographs, video, movies, videogames, audio recordings and computer programs. To connect to the internet you need a computer with a modem, a phone connection and an account with an internet service provider (or ISP).